Breccias play a major role in the impact signature of the Azuara structure. Because of the young post-impact sediments completely covering the central part of the crater, the investigation and sampling of impact breccias is limited to the rim zones. Here, however, the outcrop conditions are excellent. Various kinds of monomictic and polymictic breccias can be observed not to forget an extensive megabreccia. 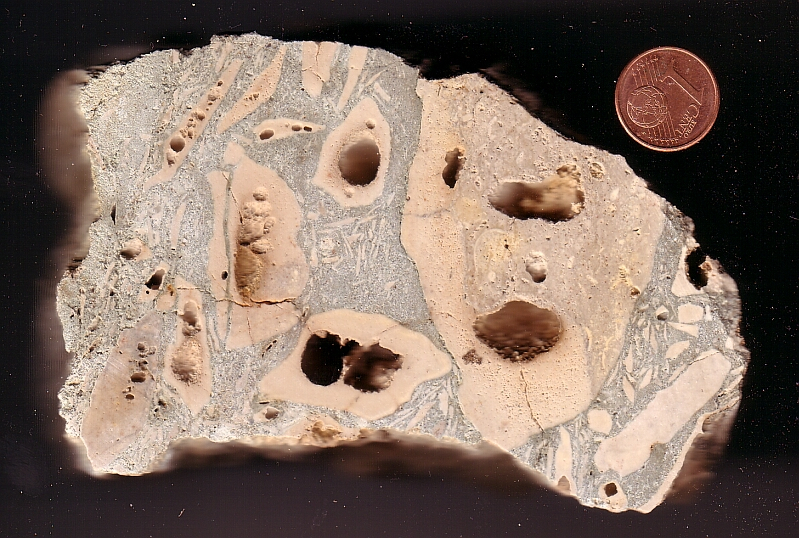 The dominantly carbonate rocks of the target contribute to many peculiar properties of the breccias like carbonate melt and decarbonation features. 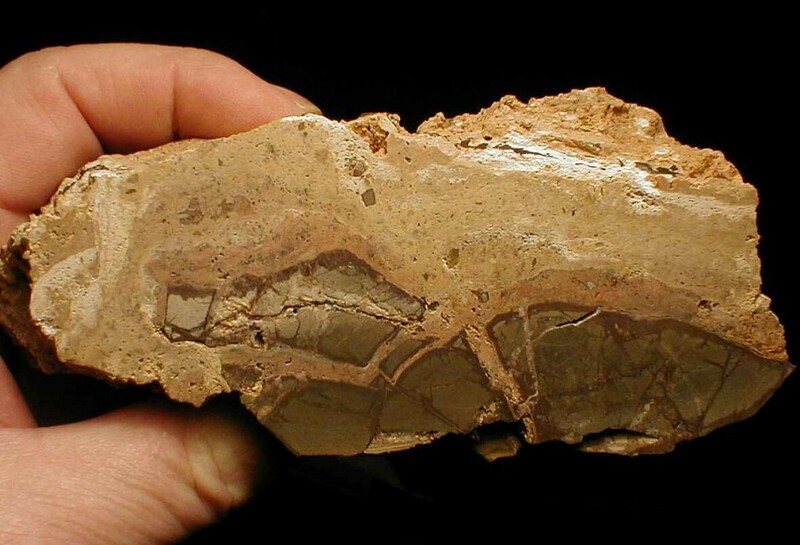 A special type of polymictic breccias in the Azuara structure is represented by the so-called basal breccia, a suevite breccia with transitions to impact melt rocks (see the The suevite page). Strongly shocked impact breccias from the Paleozoic area around Santa Cruz de Nogueras and Nogueras. Depending on a content of impact melt glass the shocked breccias range between suevites and lithic breccias; see our comments on the impactite nomenclature and classification. Fig. 1. Azuara impact structure: strongly shocked polymictic breccia with flow texture and plastically deformed components. Near Santa Cruz de Nogueras. Millimeter scale. Fig. 2. 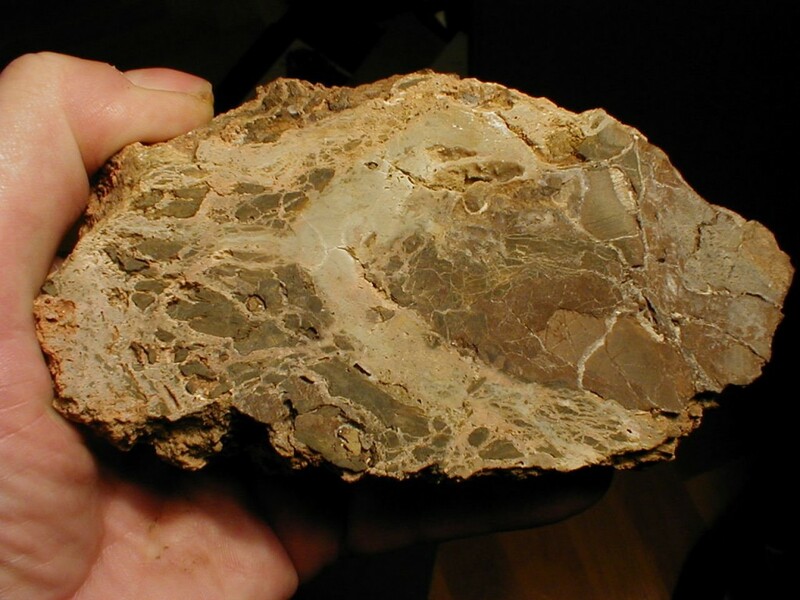 Azuara impact structure: Polymict breccia displaying a component heavily torn to shreds. Note the flow texture, the preserved fitting, and the strings of fragments with continuously decreasing size. Near Santa Cruz de Nogueras. Fig. 3. Azuara impact structure. Shocked polymict breccia with dominating Paleozoic sandstone components (near Santa Cruz de Nogueras). Note the knife-edged fractures and the preserved fitting of the components. This suggests immediate embedding and “freezing” within the matrix after brecciation. Fig. 4. Azuara impact structure: Shocked polymict breccia displaying flow texture and peculiarly decomposed components. Exposed near Santa Cruz de Nogueras. Fig. 5. Azuara impact structure. Shocked polymict breccia (near Santa Cruz de Nogueras). Note the whitish crust of the dark limestone components, which probably results from decarbonization at elevated temperatures. Comparable decarbonization crusts are observed also in impact breccias of the Ries crater. Fig. 6. Azuara impact structure. Shocked polymict breccia (near Santa Cruz de Nogueras). Matrix flow and fitting clasts. Fig. 7. Azuara impact structure: Shocked polymict breccia (near Santa Cruz de Nogueras). The components are completely decomposed and sandwiched in the matrix displaying distinct flow texture. Fig. 9. Azuara impact structure: Polymict basal breccia composed of Paleozoic and Mesozoic components (exposed near Herrera de los Navarros). The whitish zones of the matrix may be composed of decarbonized limestone or/and relics of carbonate melt. The sharp-edged clasts mixed from Paleozoic and Mesozoic target rocks prove short-term transport, mixing and emplacement. In impact polymictic breccia deposits this is a common observation and is explained by the complex excavation trajectories which may cross and bring together material from various and faraway stratigraphy. Fig. 10. 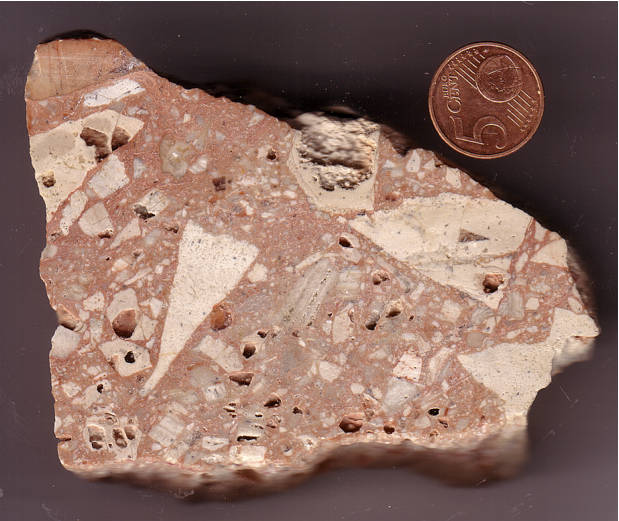 Polymict basal breccia (sawed and polished surface) from the Azuara impact structure (south of Fuendetodos). 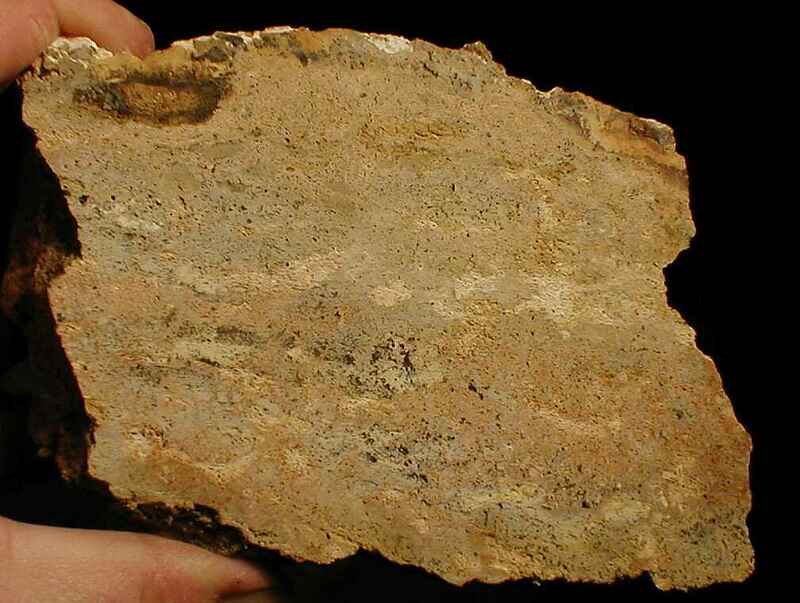 Partly melted and/or decarbonized limestone fragments in a dense and extremely hard matrix showing flow texture. Note the ‘ghost’ component (arrow) where only few well-rounded, interior particles have survived. The basal breccia is considered an equivalent to suevite impactites in other impact structures (also see Ernstson & Fiebag 1992, and The suevite page). Fig. 11. A different aspect of the basal suevite breccia (from the Cucalón deposit). 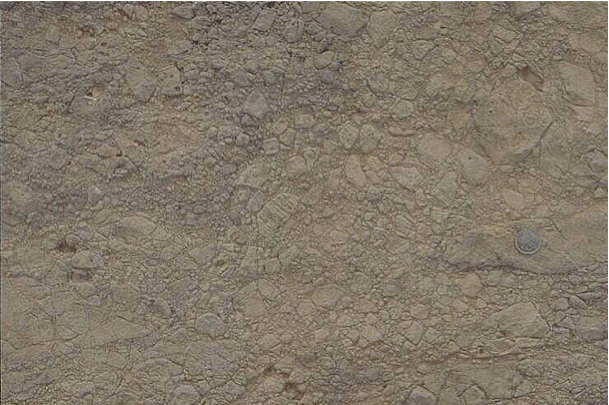 Sawed and polished surface; scale bar = 1 cm. Fig. 12. Azuara impact structure: Polymict basal breccia. Note the flow texture and the grading of the components which are preferentially adjusted to the flow. 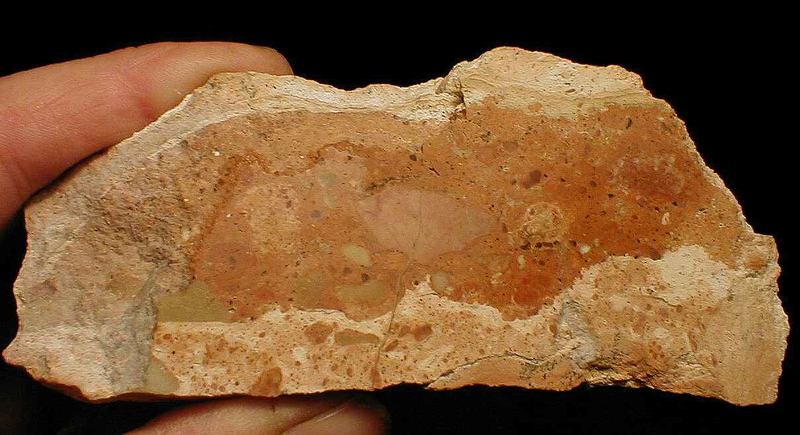 The reddish color of many breccia carbonate clasts is explained by enhanced temperatures. Exposed near Monforte de Moyuela. Fig. 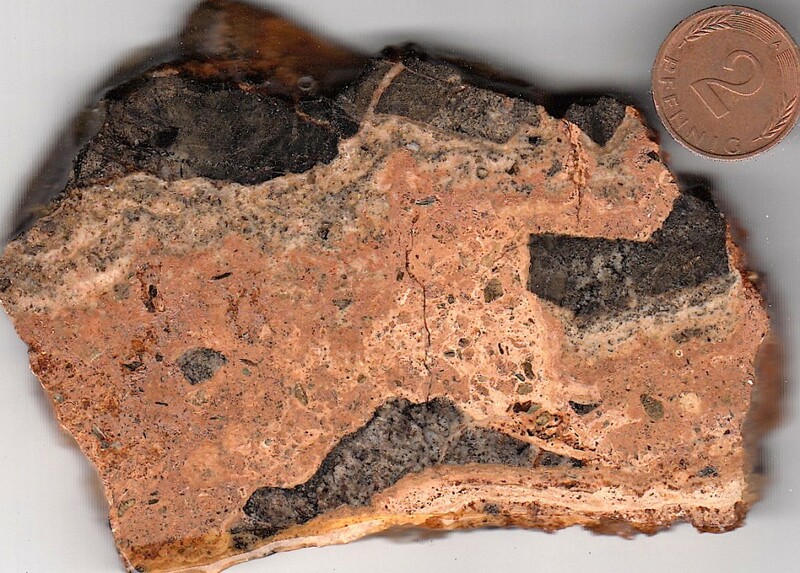 12-1.Similar texture of the polymictic impact breccia like in Fig. 12. El Portillo basal breccia variety, south of Fuendetodos. Fig. 13. Azuara impact structure. 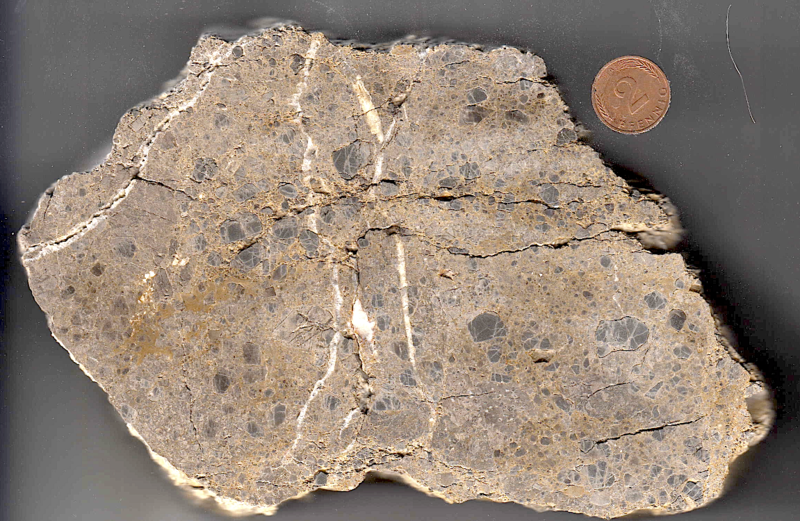 Polymictic carbonate impact breccia displaying at least three breccia generations (breccia-within-breccia-within-breccia). Sawed and polished surface; from a single large block near Monforte de Moyuela. Fig. 14. Azuara impact structure: Shocked polymict breccia (near Santa Cruz de Nogueras). 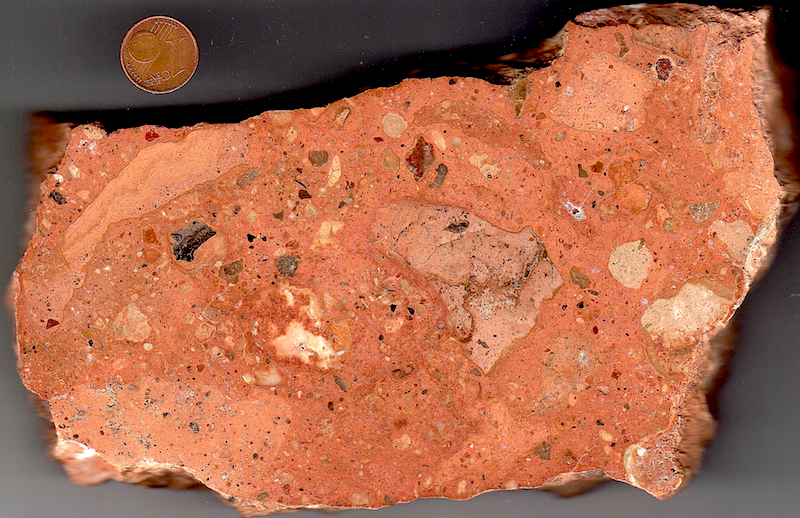 The clast-poor breccia contains a large amount of relics of probable carbonate melt contributing to the matrix. Fig. 15. Azuara structure: polymict impact breccias displaying different matrices in sharp contact. Near Santa Cruz de Nogueras. 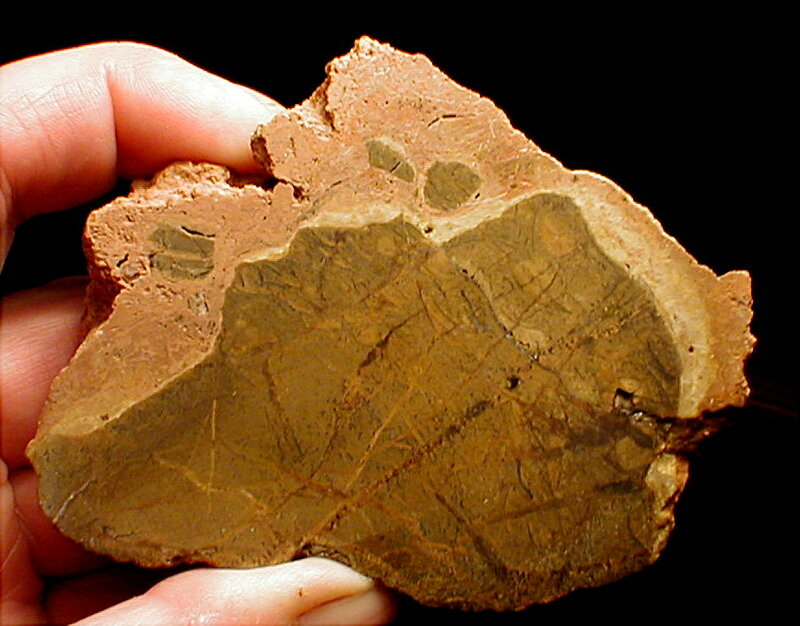 At first sight, the breccia might be confused with calcrete. However, the sharp-edged components and shock-metamorphic effects confirm an impact origin. Fig. 16. Azuara structure, similar to Fig. 15: polymict impact breccia displaying different matrices in sharp contact. Near Herrera de los Navarros. Fig. 17. Matrix-rich breccia from Jaulín, Azuara impact structure. 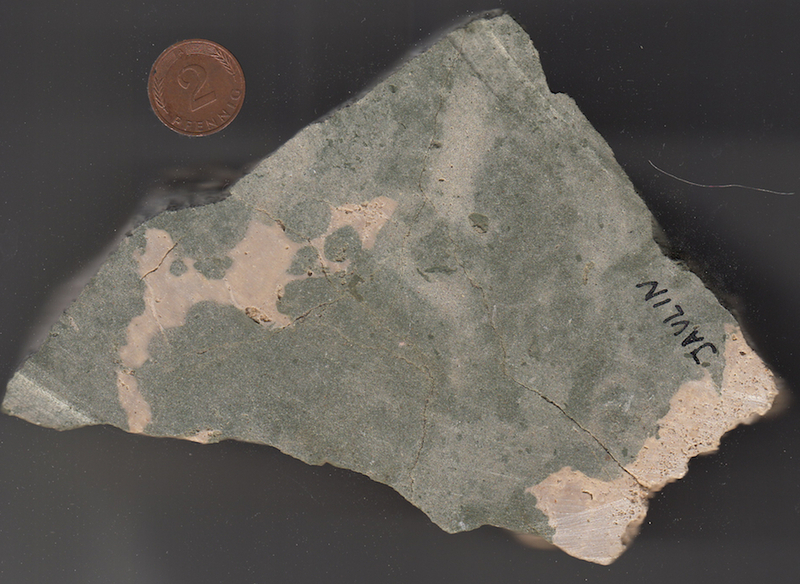 The matrix is assumed to be composite of whitish Jurassic and greenish Tertiary material. Problems may arise with regard to a proper classification of impact breccias and monomictic breccias in general. Practically in all textbooks and Internet texts on breccias the term “monomictic breccia”denotes a breccia in which the angular clasts have the same composition and are fragments from one rock. However, this definition lacks any word about the matrix and its origin. 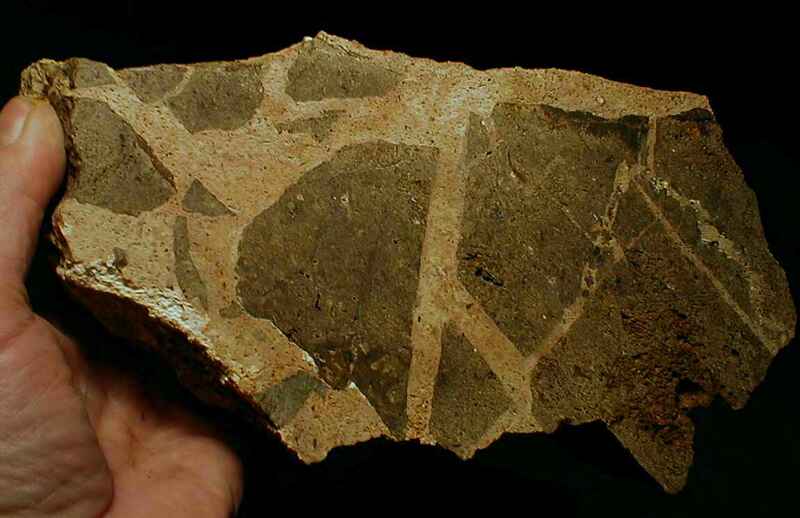 We may imagine a tectonic monomictic fault breccia composed of the same clast and matrix material. No trouble at all. 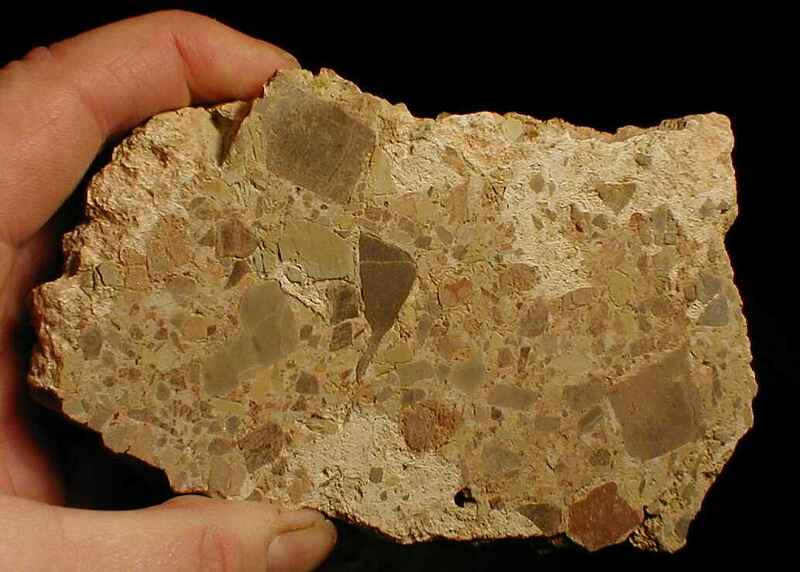 But a breccia may be composed of fragments from one rock only but which are embedded in a matrix of different origin and composition. The question arises whether this is still a monomictic breccia. 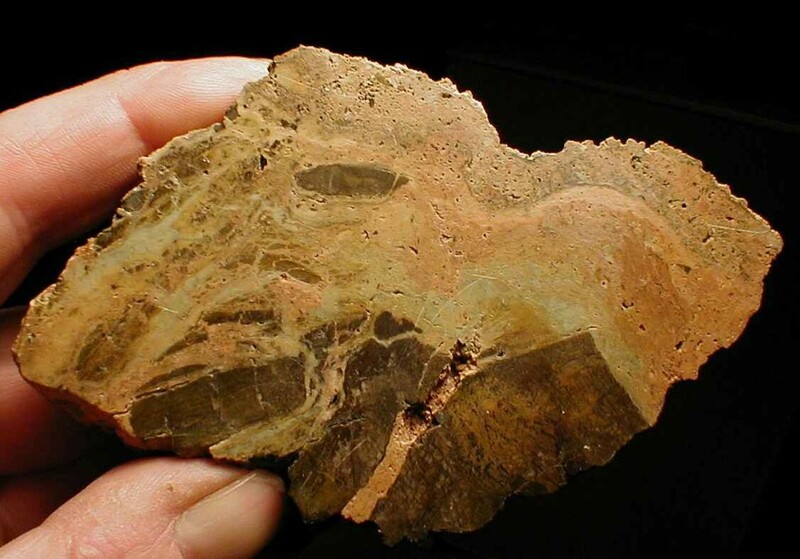 The problem increases if the matrix itself is polymictic and a clear distinction between breccia clasts and matrix particles proves difficult. Exactly this situation is frequently given with impact breccias having originated from monomictic rock fracturing and a subsequent, often high-pressure emplacement of the monomictic clasts in a polymictic matrix from elsewhere. We suggest that in these cases the term pseudo-monomictic breccias may apply. Fig. 18. Azuara structure near Muniesa: peculiar breccia with flow texture and plastically deformed limestone clasts adjusted to the matrix flow. 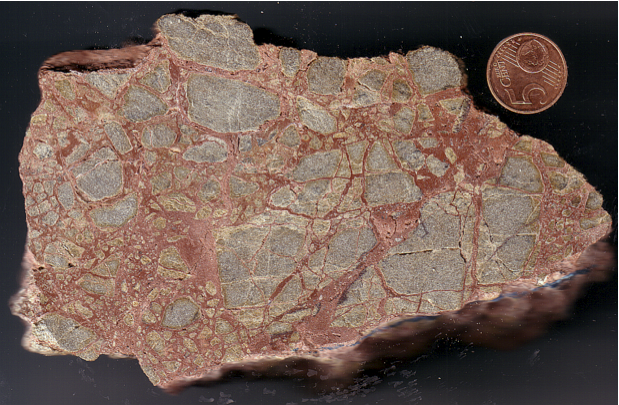 This breccia may be termed typically pseudo-monomictic. Sample courtesy of P. Bockstaller. Fig. 19. Azuara impact structure: suevitic basal breccia deposit near Cucalón. 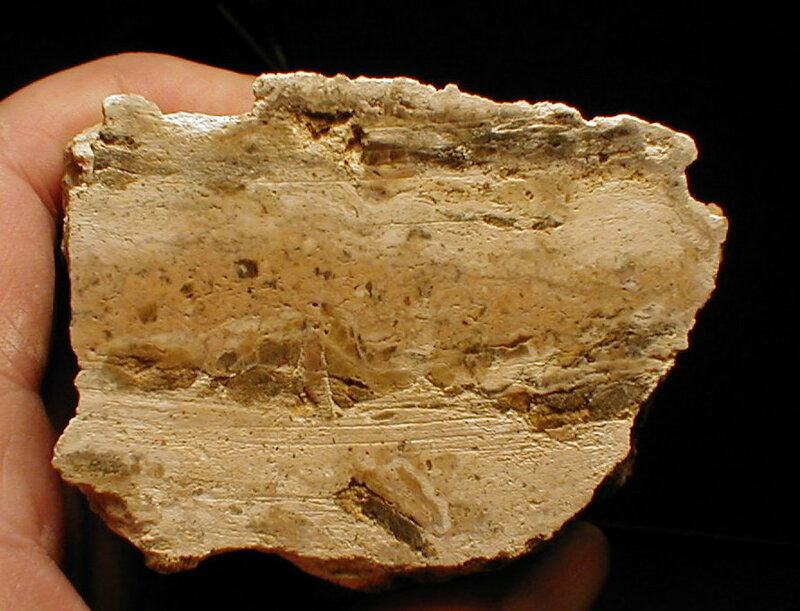 Typically pseudo-monomictic texture with monomictic limestone clasts in an allochthonous matrix. Fig. 20. 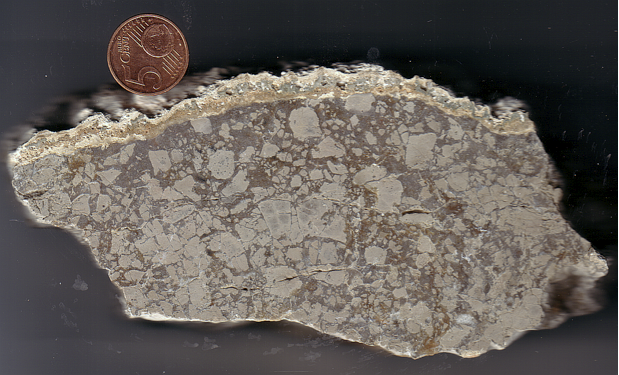 Pseudo-monomictic impact breccia from Jaulín, Azuara impact structure. The monomictic clasts are Jurassic; the grayish-greenish matrix is probably Tertiary (possibly Cretaceous). 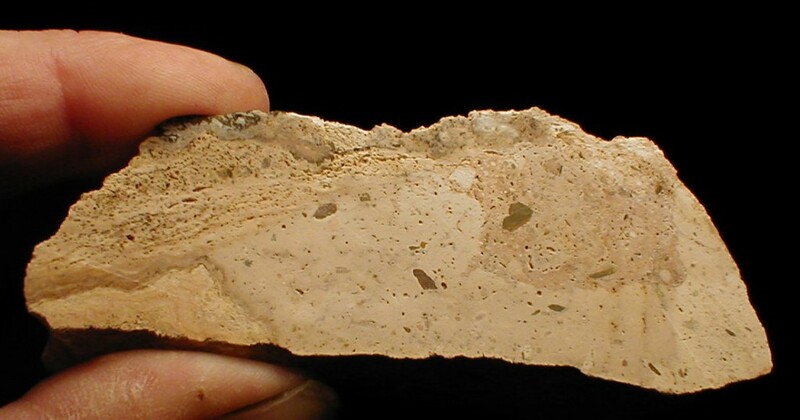 The peculiar holey clasts are a typical feature in the Spanish impact structures and are related with a focusing of temperatures from shock release which lasted longer in the interior of the rock fragments to decarbonize and melt while the outer shell cooled more rapidly. 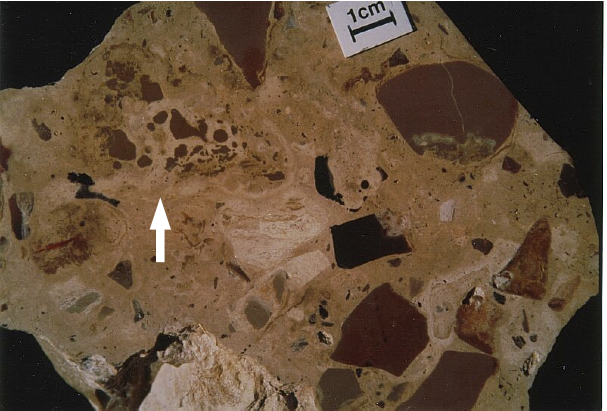 The same effect is seen in many clasts of the breccia in Fig 19. Fig. 21. Azuara structure near Herrera de los Navarros: monomictic impact breccia; limestone clasts in an allochthonous matrix show beginning decarbonization. Fig. 22. Azuara structure near Herrera de los Navarros: dolomitic monomictic breccia clasts and intruded reddish carbonate matrix: typically pseudo-monomictic breccia. The distinct fitting of many clasts points to a high-pressure process of breccia formation and consolidation. Fig. 23. Azuara impact structure near Herrera de los Navarros: Muschelkalk monomictic breccia displaying intense grit brecciation and partly mortar texture. Fig. 24. Monomictic impact breccia showing intense mortar texture. Note the distinct fitting of most of the components. Muschelkalk limestone, Monforte de Moyuela. Coin diameter 23 mm. Fig. 25. 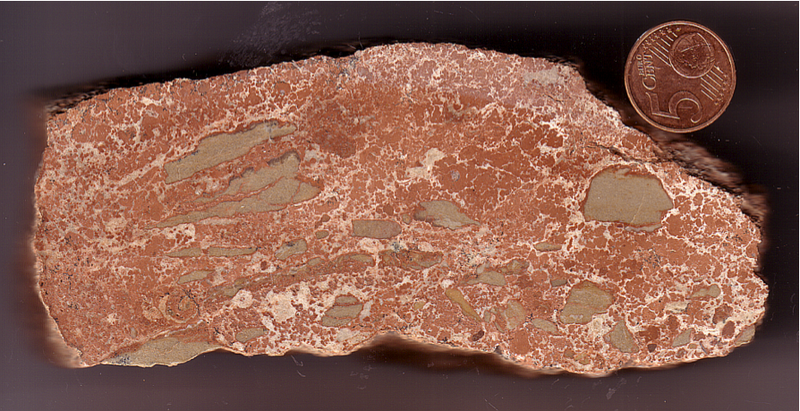 Typical mortar texture in a monomictic breccia. Azuara impact structure, near Herrera de los Navarros. The white dikelets may be ascribed to post-impact hydrothermal activity. Fig. 26. 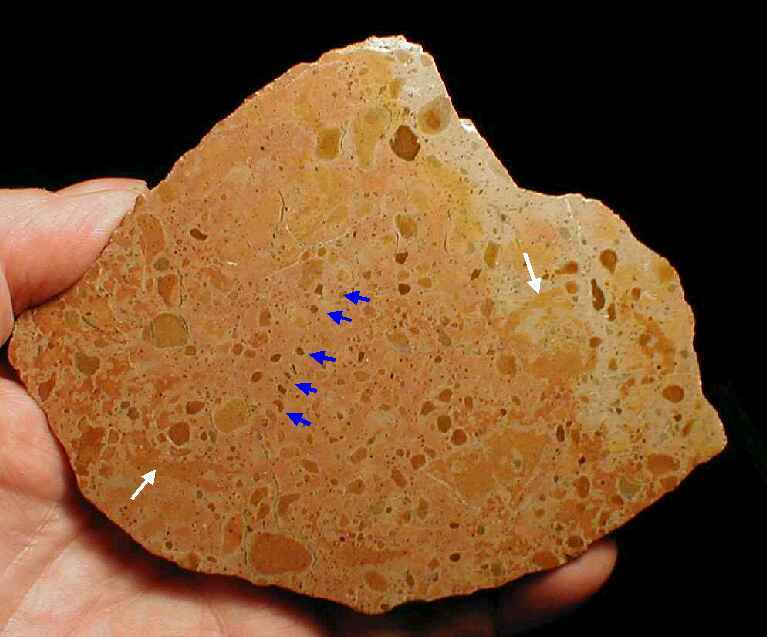 Azuara impact structure: This polymictic rock is a breccia in a broad sense only. The globular components turn out to be glomerations of smaller globular fragments, and the matrix itself is also composed of globules down to microscopic size. The texture of the rock shows intriguing features such as distinct strings (blue arrows) and whirls (white arrows). Therefore, soil formation (e.g., caliche) can basically be excluded. 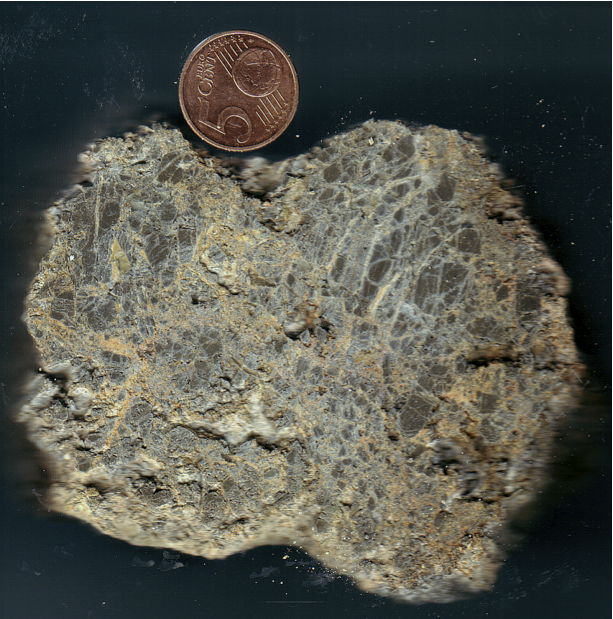 Instead, we suggest the rock to be an impactite and the globules to have grown by addition of finely dispersed material in an explosion cloud and, such, to form accretionary lapilli (Graup, 1981, in a paper about the suevite of the Ries impact structure). Hence the rock may be termed a lapillistone.